I learned something interesting this weekend. Motherhood has changed me in a funny way. The smell of my toddler’s vomit in the middle of the night does not turn my stomach. A handful of vomit is just something I’ve got to hold onto until I can throw it away after settling the baby back down to sleep. Sheets that smell like vomit can wait til tomorrow to be changed, or even the next day, if it looks like the gombu is going to last a while. Leaving work early to go home and be immediately barfed on is still worth it for the look in a Boogedy’s big brown eyes when dad says “mom’s home!”. A look that says, “this substandard Dad-care is no substitute for Mommy-love when I’m ill”. He was sicker than this last January, when he was so wan that he could neither protest nor enjoy a pony ride. Those thermometer pacifiers are Nice, if a tad inaccurate. 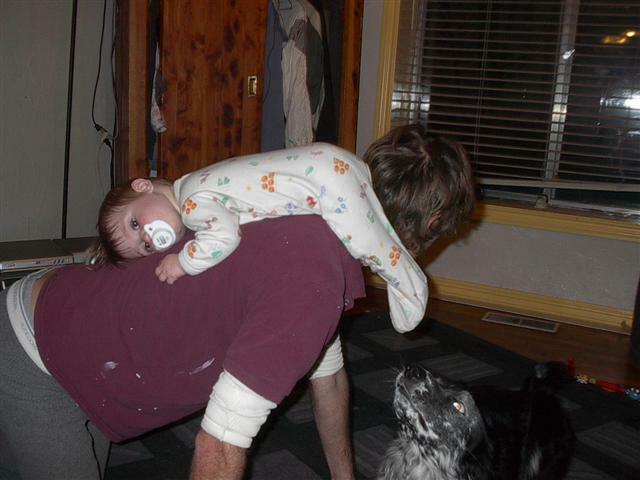 Substandard dad care? Hey she’s dissing you on her blog Zach. make the boy some chicken soup. With chicken. Hope he feels better soon. I do my best to pretend I’m still asleep and let Sara deal with the vomit on her own. I can only deliver high end substandard dad care during the day. At night, I prefer no care at all.